HPC is a modified natural limestone feature. 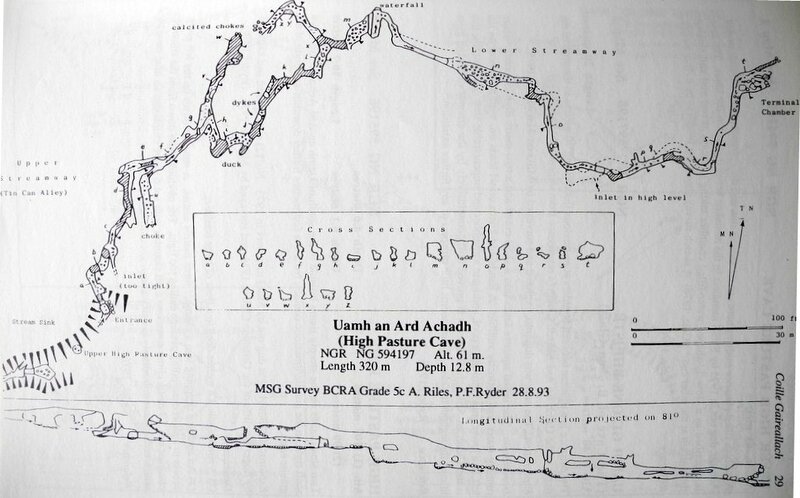 Volcanic activity and an underground water course created 320 metres of passages in the Cambrian Durness limestone making it the second longest cave system on Skye. During our visit we penetrated as far as the ‘duck’ from the entrance. High Pasture Cave is extremely attractive, reminiscent of a long grotto with stalactites and rimstone or gour formations. 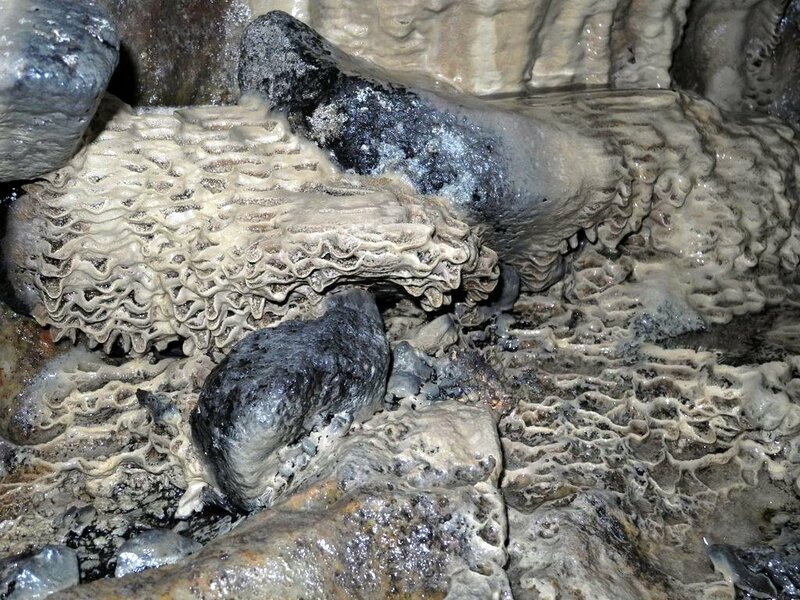 This occurs when minerals including calcite build up in cave pools leaving deposits above and below which flow sinuously and seem to drape surrounding rocks like frilly curtains or coral formations. Perhaps ancient people also had a sense of the layers and strata and responded positively to these natural forms. We were careful not to damage any of this fragile interior when moving through the cave on hands and knees or crab like on our haunches. This ecological niche supports cave spiders. As water tables and levels changed wide channels were carved into the cave floor. Large blocks of basalt lie across and block some of the channels. Cavers first penetrated the site in 1972. They named it High Pasture Cave. Archaeologist and caver Steven Birch observed evidence of human activity and he and his colleagues Martin Wildgoose and George Kozikowski commenced the excavation alongside many others including students and volunteers. The excavation lasted from 2002 to 2010. 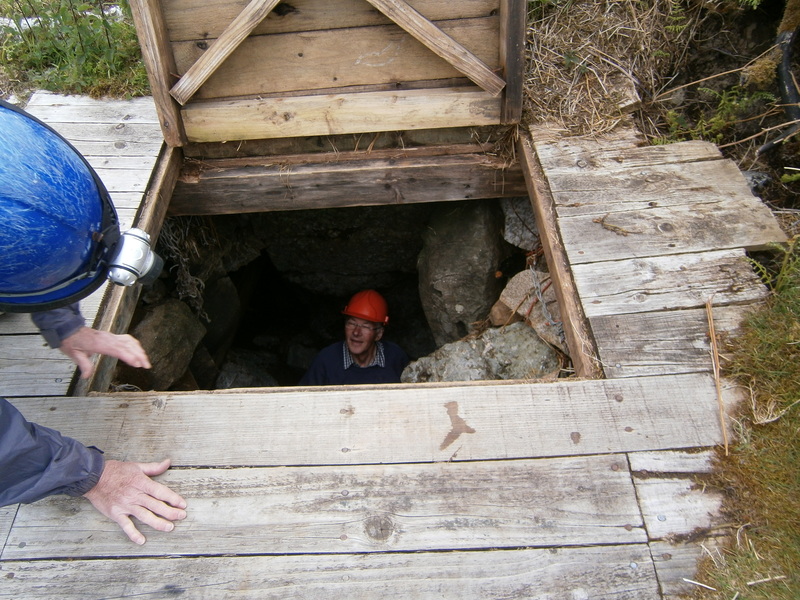 The cave was accessed via a chimney like drop from the surface as shown in my photograph of Martin Wildgoose entering the cave. This was followed by a squiggle through a narrow entrance followed by a crawl along a channel. The hard hats and torches supplied by our guides and the wellingtons they advised us to wear were essential. 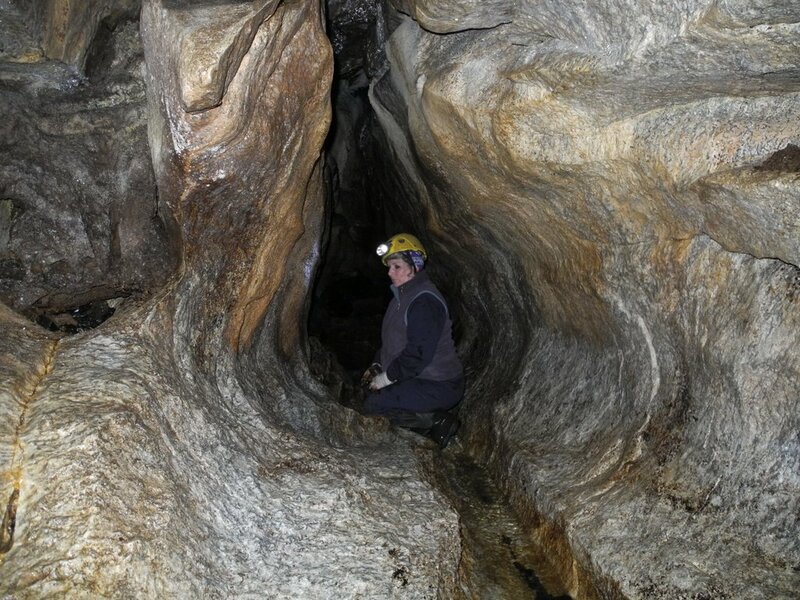 When there is heavy rain the cave system floods and may take several days to clear. We were fortunate as the weather had been dry preceding our visit but in places there were wet sumps to be negotiated. The eight year excavation provided evidence for activity around and within the cave over c7000 years. The last ice age left a terrain which allowed vegetation and fertile soil to develop. Stone Age people gradually moved into North West Scotland. Midden heaps, also stone and bone tools found during the excavation suggest that Mesolithic or Middle Stone Age folk (5000-1000BC), perhaps seasonal hunters seeking shelter, utilised the cave and camped in the area. 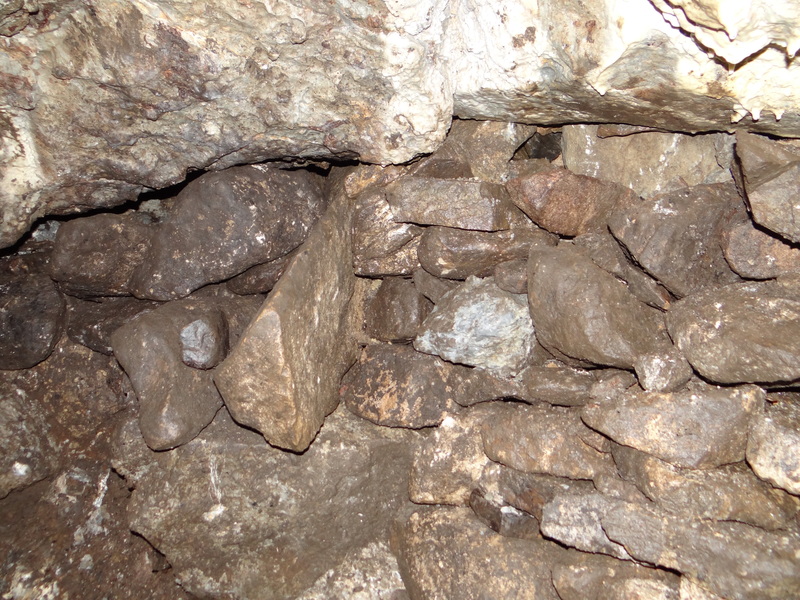 Charcoal deposits suggest that the cave was used throughout the Neolithic (4000-2000BC) and Bronze Age (200-700AD). During the more socially complex and perhaps turbulent Iron Age (700-100AD) activity around HPC seems to have increased with a path constructed approaching the cave entrance. The excavation found evidence of a large fire and burnt mound in this area which seemed to result in the entrance eventually becoming buried under centuries of ash. Further archaeological evidence suggests that HPC might then have been used as a votive site. A stone stairwell was constructed allowing access into the cave and the deposition of domestic items within the cave. These items were mainly female related including needles, spindle whorls, beads and querns. Some items were found in clusters and others deposited singly. There is an excellent on-line photographic gallery of the finds. Martin Wildgoose also pointed out that HPC is in the township of Kilbride (Bride’s cell or holy place). Bride was a Celtic deity, the goddess of the hearth and childbirth. Bridget is the Christianised version of Bride. Perhaps this explains the high number of female domestic artefacts excavated. The cave acoustics are of interest. About forty metres within the cave there is an area where sound has a noticeable, pleasing resonance. Using his voice George Kozikowski demonstrated this to great effect. He also encouraged us to sit silent and still within the cave for a few minutes and focus on the natural sounds such as the plashing and dripping of water. Many of us enjoyed and were moved by experiencing these moments of different levels of quietness and again it is tempting to suppose that ancient people were also aware of the acoustics. 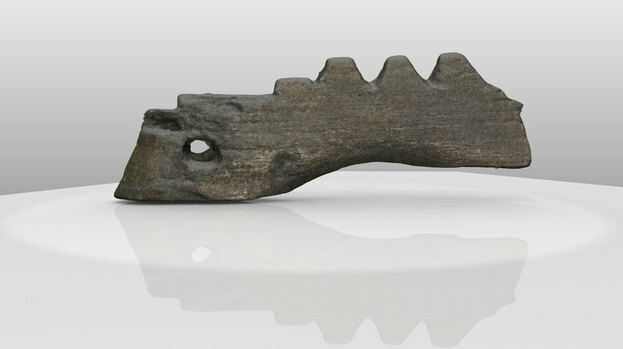 It is perhaps relevant that a fragment of what is probably Europe’s oldest string instrument (the bridge of a 2300 year old lyre, a U shaped harp like instrument) was found in the ash of the surface fire suggesting that complex music, perhaps using a musical instrument and the human voice were an important part of ritual life around HPC and perhaps more widely within Skye and the Hebridean Islands. 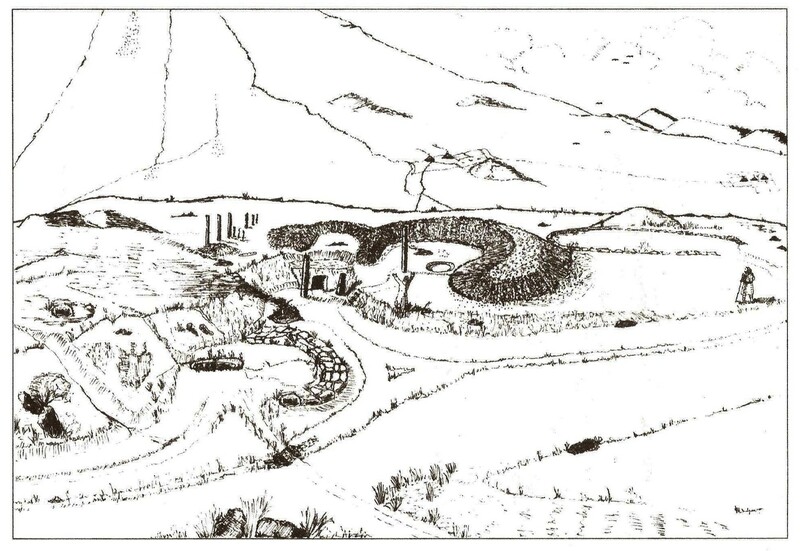 From 350-100 AD it appears that many small fires replaced the single large fire and the burnt mound grew larger. Personal and domestic items were buried throughout HPC and grain was scattered over the cave floor. Broken pottery, the remains of forty pigs and an adze (axe like implement) all dating to 150 BC were also deposited within the cave. Martin Wildgoose suggested that it is possible these might constitute the remains of a huge ritual feasting and drinking session. George Kozikowski pointed out an area within the cave where approximately 100 BC three cows were carefully buried. At around this time the stairwell was also filled with clay and stone, on top of which were placed the skull and torso bones of a foetal pig, a human foetus and a child of approximately two months old. Above these remains a bed of catkins, white holly and water lily was laid and a woman of 25-40 years was placed on top with the remaining limbs and bones of the human foetus placed in the area of her abdomen. The bones of the baby were placed between her legs. The foetus and baby were genetically linked to the adult female. As a midwife I found this compelling. Further clay and boulders were laid on top to cover them and close the stairwell. 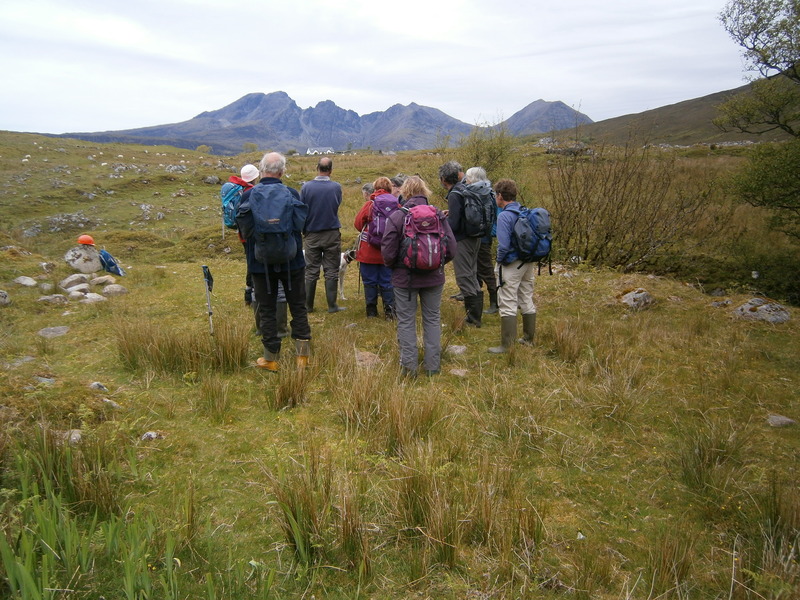 The site was then abandoned until the nineteenth century when there is evidence of crofting activity commencing in the area, perhaps a displaced family moving to the area as a result of the Highland Clearances. When excavation within the cave ceased it was backfilled and the excavation team concentrated upon the many structures within the surrounding landscape. Dating and examination of archaeological artefacts removed from the cave is ongoing. There are other caves in the area including Cave of the Seed where archaeological evidence was also found. Unfortunately we did not have the time to visit these sites. The back filled stairwell of the original cave entrance. Many of us found the visit to HPC a profound experience and NOSAS are indebted to Beth Beresford for organising it and to Martin Wildgoose and George Kozikowski for acting as our guides. Thanks also to Steven Birch for further information (I questioned him whilst volunteering on the recent Cromarty Burgh excavation). We look forward to future updates with respect to ongoing research and findings on HPC.